Note: This post has been in development for months, as I sought a balance for it. Intrigued, compelled, yearning to act, but cognizant of how little I really know about the subject. I haven't felt this way since I was a sophomore at the University of Montana. At the time, I had just learned about "food system issues" in a way that was personally moving and relevant, thanks to a movie entitled The Future of Food. Think Food, Inc., but several years older. After seeing that movie, my best girlfriend and I vowed to go home, throw away (ahem, compost) everything in our fridges, and start over right! Recently, I recognized this feeling again, but in an utterly new and unexpected arena. 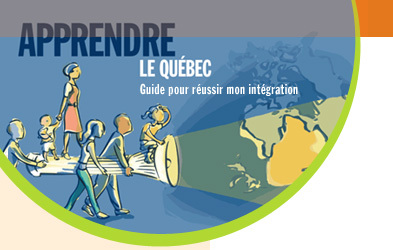 I am talking about the messy intersection, the complete mélange, that comprises the immigrant experience for non-francophones here in Québec. 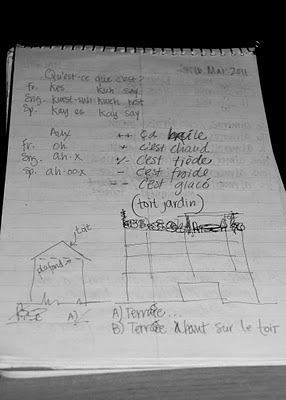 While my husband and I continue to experience all sorts of minor and major discomforts as a result of our débutant level of French, they in no way compare to the experiences I observed among my classmates. I am enrolled at a school which teaches GED-equivalent classes for adults, operates a large program for disabled adults, and offers a Francisation program for immigrants such as myself. My classmates and I qualify for this subsidized language program because we possess the appropriate visa or immigration status, and either work part-time or are being supported by Emploi-Québec while we study French. The courses are called Francisation rather than simply "French" because we learn a bit about Québécois culture, governance and history while striving valiantly to apprendre la langue - learn the language. would instinctively pronounce certain words or phrases. I speak of my classmates and I as "we", but I use the term loosely because we are Lebanese, Chinese, Bhutanese, Nepali, Tibetan, Columbian, Burmese, Indian, Canadian and American. A few of us chose to come here, a couple married Québecois, and at least two of us (myself and the other Canadian) can leave any time we like. But most of the class, and most of the people in the other classes, do not have much choice in the matter. In fact, many of them are actually refugees re-located from various regions of the world where life was much less hospitable. One element of the saga that particularly fascinates me is the multi-lingualism of our school. It is also the element that is arguably the most potent and complex. For example, the Tibetan man seated to my left speaks Hindi and English in addition to his mother tongue and French. The Bhutanese/Nepali people represent a geopolitical conundrum as well as an astonishing breadth of language capacity. An Iranian woman in my first French class, early this spring, was learning French while trying to improve her basic English. Imagine trying to learn two languages simultaneously, both utterly unlike your own, while adapting to life half-way around the globe from everything you know! Like them, my husband and I have been working hard to orient ourselves to a new reality. This is the first time either of us has lived this far from home (the western U.S.), and the first time we have been "ex-pats". I realize now how much I previously relied on my ability to collaborate, share resources, or direct someone to the right community organization. Here, due to the language obstacles, it has taken nearly a year to reach a level of familiarity with local organizations, and to realize how starkly limited the English-speaking community's community resource options are. In this city, less than 2% of the population are Anglophone, and you can feel that everywhere. The distinct minority status of the language here is palpable. What that means is that it can take someone looking for resources in English months to find them. For the allophone immigrants and refugees who move here, they may never learn of them. Many of my classmates speak fairly functional (or better) English, and have been educated in their home country. And yet, they are destined to spend years struggling to learn enough French to get a basic service-level job. They relate to me their fears of loosing their English skills, and of their children not learning English and therefore being severely limited in their options later in life. And I think to myself, "I know of a couple places you could go!" There is a local organization called the Voice of English-Speaking Quebec, which often refers people like me to programs like this Francisation program. They also offer a range of "newcomer" services, including resume assistance, social activities for newcomers, and connections with English-language literacy and health services. There is another, Quebec City Reading Council, which offers adult tutoring, family education programs, and even classes on how to get your drivers license, process a citizenship application or understand your health services rights in English. A third, the Morrin Centre, hosts an English-language library, lectures, discussions, workshops and other cultural events. There is even a hospital, Jeffery Hale Hospital, where you can receive social, psychological and medical attention in English. However, no one tells these immigrants about these organizations. In fact, I have found them only through doggedly searching for them, convinced by my cultural frame of reference that they must exist. I have an utterly astounding anecdote to support this. Knowing about this information gap, I tried for nearly 3 months to share this information with my classmates. I took every opportunity to tell them individually, and to give them websites, phone numbers, and descriptions of services and cultural programming available in English. It all culmianted in trying to arrange a presentation of said organizations for the participants of the Francisation program. Along with staff from two local organizations, I worked to find an "institutionally palatable" way to tell my classmates about these programs. J'espère que tu vas bien! J'ai parlé avec Madame B. concernant la visite de [local org. name]. Elle m'a dit qu'ils utilisent déjà les services (de temps en temps) pour quelques étudiants anglophones. Donc, aucune possibilité pour venir présenter les activités ici. It translates to say that the woman who manages the Francisation program is aware of the organization, and occasionally refers anglophone (English as a first language) students to this service. To quote directly the final sentence "So, absolutely zero possibility to come present their activities here [at the school]." This response boggles me. We didn't intend to present to the staff. Anglophones may already be looking for these services, and will find them eventually. The people who need them, and deserve to be told about them, are the allophones, from whom such services seem to be deliberately hidden. This instinct to obscure English derives from concern that any efforts in English will reduce willingness or ability to study French. I am not saying this out of speculation, and more than one instructor has said exactly that to me. I can only imagine how my classmates must feel at the end of the day. For me, it was a real struggle to find meaningful work - something other than working evenings teaching ESL to business people. I know there are nonprofit organizations out there, offering meaningful services. And I know there are people who would benefit from them in real-life, honest-to-goodness, make-a-difference ways. And, I know I haven't been this fired up about something since I first learned about food system issues as a sophomore in college. Right now, that is what I know. That, and the fact that I need to work more on the passé composé verb tense. But, if you ask me how this translates into meaningfully participating in the community here in Québec...well, some days, after interactions like the one described above, I am at a loss. For the first time in my life, my communication skills are nearly worthless. While I can comfortably manage daily transactions (bank, groceries, etc.) and even chat with people in French, I can't inspire or intrigue them. I sound like a child, trying to explain something inarticulate, intangible, and I receive similar reactions. Perhaps my idealistic sensibilities are encountering a non-American reality, and it's "healthy for me". Whatever the case, I am realizing that without a network, without an interwoven web of realities, ideals, mutual interest in individual cultures and a sense that something can be better tomorrow than it is today, nothing changes. People will continue to struggle to adapt to a foreign language, climate and culture. They will miss home desperately, even if it is a violent, dangerous and seemingly ruined home. They will admit to reporters that they had no idea they were coming to a place that didn't speak English. I came here eyes wide open, and have run into the same system of intractable social programs. I don't have any advice. I come home daily with more questions. How does one go about "belonging" here? How does one participate? How does one do more than spectate? At the root of it, I am realizing those questions are the same questions I asked myself several years ago. Then I was high on the righteousness of food system issues and a sense of belonging in a place. Now, I am "low" on networks, low on ideas, and have just recently started to find local food outlets, all of which are 100% French-language operated (see this and this post). Since the legal system is different here (distinct from the rest of Canada), and the political system differs, too (British-style parliamentary governance, like the rest of Canada), it could take a lifetime to figure it all out, language differences notwithstanding! Between now and then, what? I am sincerely in a conundrum over how to respect cultural differences, pursue a language I am actually getting better at, and contribute something meaningful. Perhaps, that is what there is for me to do here right now - listen, respect and build connections, one classmate at a time. And, perhaps it's also time for some one-on-one, grassroots-style organizing. Maybe I will load up my school bag with flyers, and give the presentation one person at a time, hoping I tell someone for whom that information makes a difference. 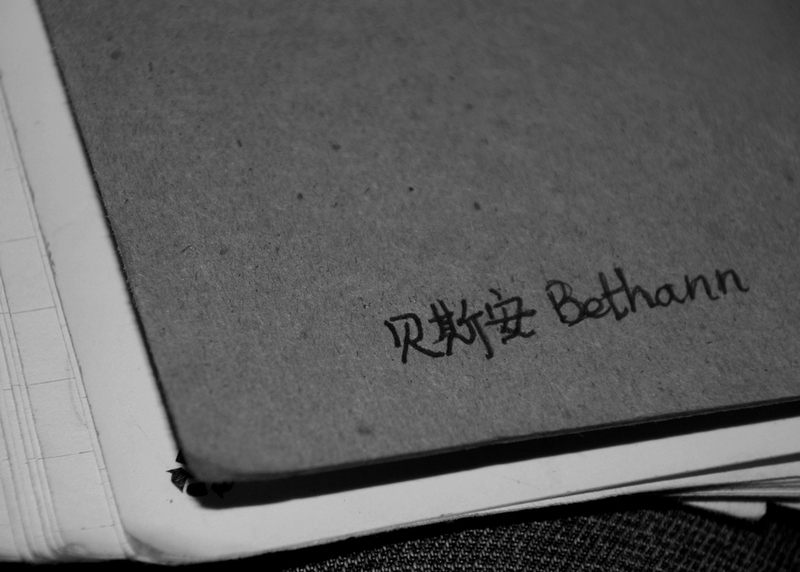 My name in Mandarin, written by a classmate. Randomly read this for the first time...I know this was written in 2011, but would love to hear your thoughts on it now! Very fine piece. Thank you, Sarah! Let me see if I can articulate what is in my head now. Well, it was autumn 2011 that it was posted, but it took months after we moved her for me to articulate those feelings - disenfranchisement, marginalization, longing to belong. They are not familiar reactions. I've never done something like this before. It's a strange situation, because we are technically (on our visas, for sure) "temporary" here, but the immigrant feeling does not discriminate between different sorts of paperwork. If you don't have a history here, and a command of both languages, life is going to be tough for a long time. Period. 1. We both speak and write much better French than before. 2. We know the city much better, which engenders an increased sense of belonging from a geographic perspective. 3. Thanks to our jobs, we have slowly spun a social web which makes life here more vibrant, diverse, and connected. 4. The political situation in the province has changed - there is a different party in power, and they are MUCH more interested in French-language dominance. It will be interesting to see how it plays out. As a socially- and politically-interested person, despite my "temporary" non-voting status, I can't help but feel indignant about some of the proposals and how current legislation is enacted/policed. 5. At the same time, coming from Montana, the West, and the U.S., I can very much relate to the sense of pride and effort to maintain the viability of culture, heritage, and language. Bottom line, living here, no matter your background, is a complex thing if you choose to pay attention to any of the nuances.